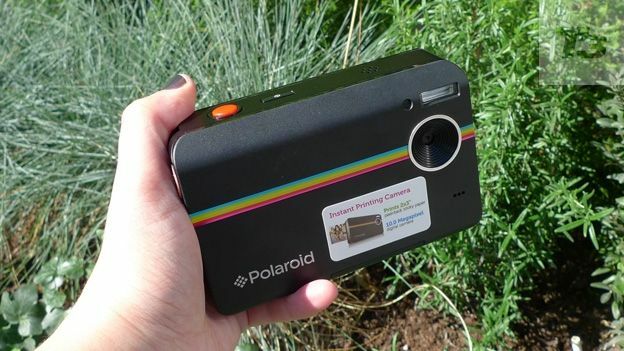 The Polaroid Z2300 is the brand's first compact camera with a built-in printer. It may be a little on the chunky side for a compact, but it's definitely smaller that the Polaroid Z340 and the Polaroid 300 and we got our mitts on it for a sneaky preview. The camera is available in black or white and there's even a rainbow stripe that harks back to the days of the classic Polaroid Land Camera 1000, giving the new snapper a slightly retro look. Controls are kept to a minimum: you'll find the power and shutter release buttons on the top of the chassis, while the back panel is home to the a basic selection of menu and function buttons as well as switch to swap between photo, video and playback mode. You'll find the all-important Print button in the bottom right-hand corner. At 3 inches, the screen is a decent size for lining up your shots and navigating around the very basic menu setup. The dislpay didn't copy too well when we took it out bright sunshine but wee'll take a closer look as soon as we get a full review model in at T3 HQ. While there's a 10MP sensor on board, it would be unrealistic to expect the kind of quality that you'd get from a decent digital camera, especially as the results are printed on 2x3in pieces of non-Smudge Zink paper. We took a few test snaps which looked a little washed out in printouts, but still perfectly acceptable if you're simply looking for a speedy way to get your hands on an actual photograph. There's an option to add a white, Polaroid-style border to your photo, making it the same size as the instant photos from the likes of the Polaroid 300 and the Fujifilm Instax Mini 50S. While decidely low-tech, the Polaroid Z2300 is still a compelling piece of kit for retro fans or those that want instant photos. Stay tuned for a full review.